Onion Garlic Pepper Jelly - Canning Homemade! 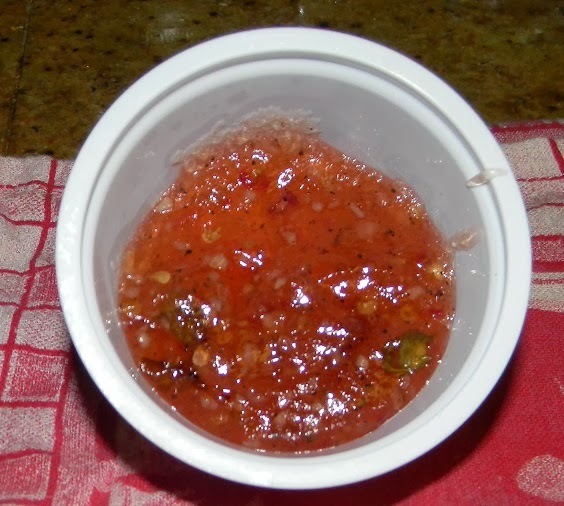 Vicky sent me a link to a very interesting recipe that was a bit of a combination of the garlic jelly and the sweet chili jam. 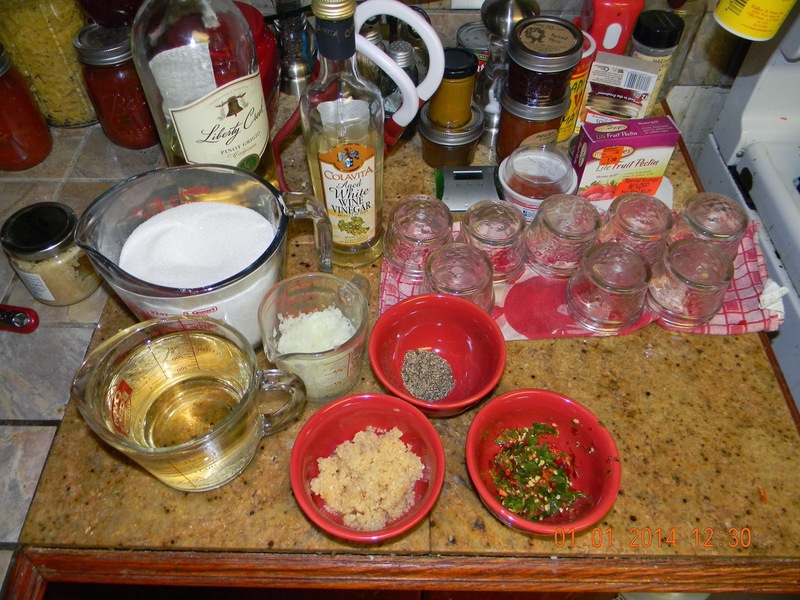 It uses dry white wine for an interesting flavor change in either of the other recipes. The wine adds the acidity needed not only to stabilize the pH of the low acid peppers, garlic and onions but also to insure that the pectin will set properly. If you don't use alcohol in your house you can use red wine, cider or plain white vinegar that is 5% acidity, but you will get a different taste to the jelly. Vicky adapted the recipe from "Cooking with Mary and friends" and ask me if it was safe for canning. Here is the recipe that is now a favorite on cream cheese with crackers or a baguette or smeared on chicken, pork or fish as a tangy finish when cooked. Thanks again Vicky for your inspiration. Preparation: Prepare 7 half pint jars, lids, and rings. Sterilize the jars and keep them in the hot water till it’s time for processing. Make sure to fill your water bath canner and get the water to a simmer. Prepare onions, peppers, and garlic. Filling the jars: On a dishtowel place your hot jars and using your funnel, ladle to fill to 1/4" headspace. Remove air bubbles and refill to the proper headspace with the mixture if necessary. Taking a clean papertowel wet it with warm water and wipe the rims of the jars removing any food particles that would interfere with a good seal. Using your magic wand extract the lids from the hot water and place them on the now cleaned rims. Add your rings to the tops of each of the jars and turn to seal just "finger tight". Processing: Make sure your rack is on the bottom of the canner and place the jars in the water bath making sure that the water covers each of the jars by 1 to 2 inches. Add hot water to the canner if it doesn't measure up. Cover the pot and turn up the heat under the canner and wait for the water to start boiling. 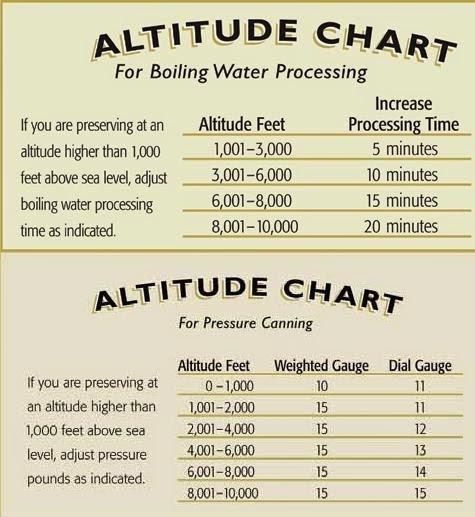 Once the water has come to a boil start your timer for 10 minutes. When complete turn off the heat and remove the cover and let the jars sit for another few minutes. Remove the jars and place them back on the dishtowel in a place that they will sit overnight to cool. Gently shake jars once sealed from time to time to evenly distribute the onions, garlic and black pepper. Do not bang on the jars as you may unseal them. You can skip this step if you are uncomfortable with doing this step. Leave them on the dishtowels till the next morning.